Asparagus with Shrimp Hollandaise is a great dish for an entree or as a main or side dish. The German recipe is using crab butter and I could not find it to purchase but it is not difficult to make it. Happy Cooking! 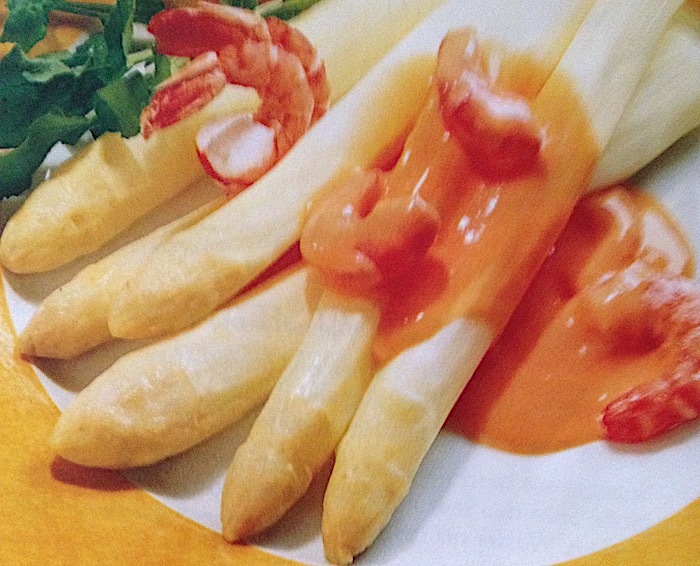 - Prepare and boil asparagus; make sauce Hollandaise per instructions and use the asparagus water for the package. - Add butter and crab butter to sauce bit by bit. - Pour lemon juice over shrimps and add to sauce, don't bring the sauce to a boil. Pour sauce over asparagus and serve hot. - Place butter on aluminum foil and form to a roll, place for 2 hours in the fridge until it is firm.